Treat yourself to a relaxing and friendly holiday in this villa with pool located near the sea. This house of a surface of 240 m2 will welcome easily all your family or some friends for the duration of the holidays. Its garden surrounded by pine trees has a large swimming pool but also a garden with 14 chairs to allow you to have lunch or have an aperitif outside. You can let your children play without problems since the entire property is walled and the pool has a pop Protection pane. Just 100 m from the house, you will find a sandy beach to play your children and walk around. For your swimming, you will find an ideal beach at 10 minutes by bike. Outside, you can enjoy the presence of a barbecue and a ping-pong table to host lunches and afternoon. SWIMMING POOL: has an electric cover which ensures complete safety. Pool heating included in rental price from May 18th to September 14th Pool heating fee and on request from April 20 to May 18, and from September 14 to September 30: 120 € per week No heating from September 30th to April 20th. From the 3 year old to the 69 year old we all had a great holiday. We have a holiday home in the UK and we felt at home from the minute we walked through the door. The grandchildren had great fun in the garden and the pool. We hired bikes and spent a lot of time exploring the island and the property was in a great location for cycle paths and the great bus service. We were close to the beach and were never lost for something to do. We had everything we needed and the separate sleeping areas worked very well. We would certainly be happy to rent the property again. The house is great, we had a great time with our two kids. 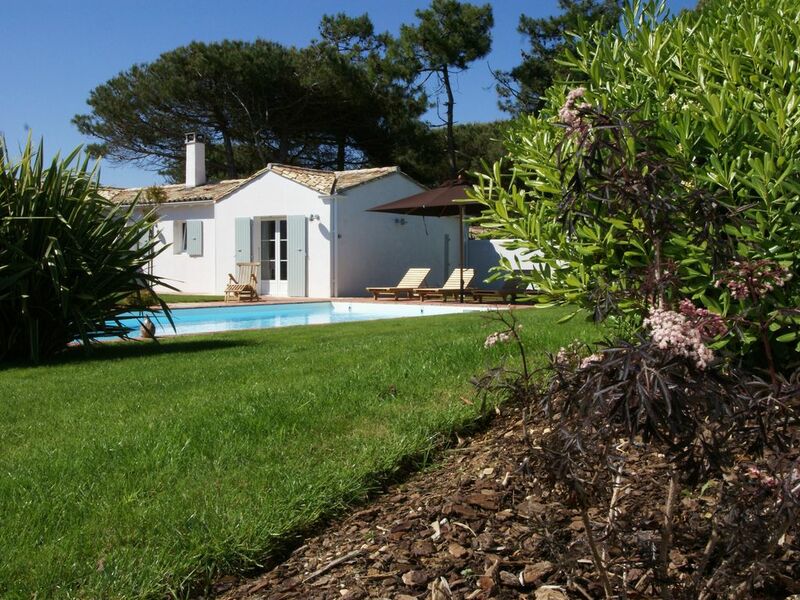 The location is perfect, close to the next little village St. Marie and not far away from Bois Plage. We rent bikes and did a few trips with the kids. The only thing which wasn't perfect was that the beach which is close by is a beach with a lot of rocks and it's nearly impossible to swim. But within 10 Minutes by bike you can reach another sandy beach. All together we had a great time and we want to come back next year if possible. We had a most enjoyable stay at this very comfortable and spacious villa which made it a perfect holiday home for our family. My grandchildren had a lot of fun in the swimming pool and the walled gardens made it a safe haven, allowing their parents to relax totally. For those that like to cook the kitchen is very well appointed and the outside barbecue and plancha are excellent. Wonderful, clean and great for relaxing! 'Wonderful' the villa was just as described, spotlessly clean, well maintained and well-equipped. We all had a fantastic relaxing break in the sun, the villa was just a few minutes walk to a sandy/rocky beach. The pool, bbq area and the gardens were delightful, I would definitely recommend this villa, just perfect! The property is very spacious and well appointed with comfortable furnishings and a well equipped kitchen. The garden is very pleasant and my kids had a great time in the pool, which is clean and safe with an electric cover. Although there were only 5 of us the property would be suitable for larger groups or two families holidaying together. The beach is only 100m away, but the shoreline here is both sand and rocks so if you want to swim you need to go along the cost, but you will need a car anyway to get to the shops and restaurants. The owners were pleasant to deal with and I received my damage deposit back very quickly. With the beach less than 100m, you will be able to swim and indulge in water sports besides, depending nevertheless the period when you rent. Bike rental companies are present in all the villages. The cycle network is well developed which makes pleasant stroll. You can also test horse riding through the many riding clubs of the island. For a night out, the nearest bar and restaurant is only 2.5 km.